The below items have been selected and various kits developed by Dr. "Arizona" to assist archaeological students and their teachers. They are perfect for Archaeological Laboratories in both the school and professional settings. Likewise, they can be used as important components in Interpretive Museum displays. Contact Us and let us help you build specific kits for your own classroom. Remember that all these items are being made or prepared once you place the order. Therefore be prepared for a delay in fulfillment of at least a month depending upon the items involved. This is a special collection of stone artifacts replicated by Dr. Arizona that provides a good start for a suitcase archaeology project. These are generic artifacts that can be used to teach about the type of stone tools that are found by archaeologists. They are not placed into displays since they are intended to be part of a hands-on teaching program where the students can handle the artifacts. All replicas in this collection are "edged" (meaning the edges have been ground for safe handling). Included in this collection are: three Flake Tools, an obsidian Core Tool, an obsidian Punch, a chert Drill, a Hafted Scraper, a Willow Scraper, two Gravers, a Denticulate, a Sizer, ten Utilized Flakes, an End Scraper, a Side Scraper, a Herb Mortar and Pestle, a soft Hammerstone, a small Medicine Bowl, Nut Cracking Stone, Arrowshaft Smoother, a Chopper, a Handaxe, three Arrowheads, a Spear Point, an Arrowhead Blunt, a Crescent, and a Ground Slate Point. The components are valued at over $600. Higher shipping cost due to weight. Expect a two month manufacturing delay. This is a special collection of bone and shell artifacts replicated by Dr. Arizona that provides a good addition to a suitcase archaeology project. 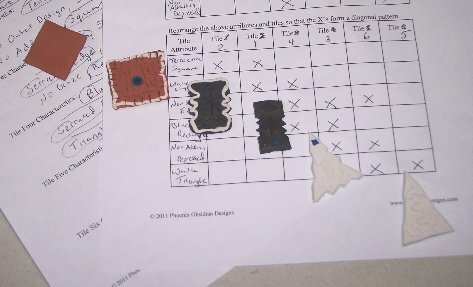 These are generic artifacts that can be used to teach about the type of faunal tools that are found by archaeologists. They are not placed into displays since they are intended to be part of a hands on teaching program where the students can handle the artifacts. All replicas in this collection are "edged" (meaning the edges or tips have been ground or dulled for safe handling). Included in this collection are: Bone Awl, two Bone Needles, Bone Scraper, Shell Scraper, Bone Saw, Bone Gouge, Bone Wedge, Gorge Bone Fishhook, Notched Gorge Bone Fishhook, X-hook Bone Fishhook, Composite Bone Fishhook, Antler Harpoon Point, Bone Pin, two Bone Arrowheads, one Shell Arrowhead, Antler Point, and a Bone Spear Point. The components are valued at over $450. This is similar to the display board used by Dr. Arizona at her demonstrations and talks. 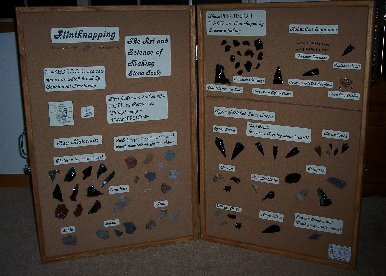 It shows the types of flintknappable materials, the various types of tools that could be made, a complete arrowhead reduction sequence, and basic identified flake types. All this attached to a portable light-weight board. There will be a manufacturing delay of at least a month. These items have been pulled together to allow teachers to set up their own sandbox dig. Included are a multitude of broken artifacts, a few completed artifacts, debitage of all kinds, ecofacts and other items. Both prehistoric and historic periods are represented in these collections. The different categories of items are packaged seperately and can be bought seperately if desired or all together. You can then choose amongst the items to build your own collections representing different activity areas or time periods. INCLUDES - Production Broken Groundstone Piece, Hammerstone, Bag of both Percussion and Pressure Obsidian and CCS Flakes, several Core Fragments, one Biface, one Chopper, four Broken Arrowheads, one Drill, Complete Arrowhead, two Flake Tools, one Side Scraper, four Utilized Flakes, one Graver, and several other Broken Knapped Pieces. At Least a $200 Value. Includes - Bone Arrowhead, Bone Awl, two Broken Bone Tools, Bone Fishhook, Bone Scraper, Shell Scraper, Shell Paint Basin, small Bag of Deer Bone Fragments, several cut Cow Bones, 1 Tooth, small Bag of Leather Pieces, small Bag of Fur Pieces, a few Antler Pieces, four Porcupine Quills, several Shell Beads and a small Bag of Small Shells. At Least a $150 Value. Includes - Wood Pin, two Basketry Fragments, Strand of Hemp Cording, a Bag of Nut Shells, many pieces of Wood, several Cut Pine Pieces, a Bag of Charred Wood Pieces, 1 small box showing Charred vs. Uncharred Dried Berries (for demonstration since the charred are easily crushed), a small Bag of Several Types of Seeds, and a bag of Fibers. Includes - small Bag of Bottle Glass, a few pieces of Historic Glass, one old Metal Can, a small Bag of Rusted Metal Pieces, five Square Nails, various Pieces of Metal Hardware, two Brick Fragments, one Concrete Piece, five Pottery Pieces, two Porcelain Pieces, and several Cloth Fragments. Includes - Lithic Collection (#ATT003A), Faunal Collection (#ATT003B), Floral Collection (#ATT003C), and Historic Collection (#ATT003D). $390 Value. These items have been pulled together to allow teachers to set up their own sandbox dig. Included are a multitude of broken artifacts, a few completed artifacts, debitage of all kinds, ecofacts and other items. These collections represent particular generic historic periods. We can modify these collections to more closely match specfic periods or regions - just ask. INCLUDES - Production Broken Groundstone Piece, Hammerstone, Bag of both Percussion and Pressure Obsidian and CCS Flakes, one Biface, one Drill, four Broken Arrowheads, Complete Arrowhead, one Graver, one Side Scraper, several Broken Knapped Pieces, Bone Awl, one Broken Bone Tool, Shell Scraper, small Bag of Deer Bone Fragments, a few Antler Pieces, two Porcupine Quills, two Shell Beads, a small Bag of Small Shells, one Basketry Fragment, a Bag of Nut Shells, a Bag of Charred Wood Pieces, 1 small box showing Charred vs. Uncharred Dried Berries (for demonstration since the charred are easily crushed), a small Bag of Several Types of Seeds, and a bag of Fibers. At Least a $200 Value. Includes - Bag of both Percussion and Pressure Obsidian and CCS Flakes, four Broken Arrowheads, Complete Arrowhead, one Side Scraper, several Broken Knapped Pieces, Bone Awl, small Bag of Deer Bone Fragments, a few Antler Pieces, small Bag of Leather Pieces, Pieces of Beaver Pelt, small Bag of Fur Pieces, two Porcupine Quills, two Shell Beads, one Basketry Fragment, a Bag of Charred Wood Pieces, small Bag of Glass Trade Beads, a few pieces of Historic Glass, and a small Bag of Rusted Metal Pieces. Includes - Groundstone Fragment, two Basketry Fragments, a small Bag of Several Types of Seeds, several Adobe Pieces, Brick Fragments, Broken Pottery, Cut Cow Bone Pieces, Rawhide Pieces, a small Bag of Leather Pieces, a few pieces of Historic Glass, several Beads, four Square Nails, a Bag of Charred Wood Pieces, and a small Bag of Rusted Metal Pieces. Includes - a few pieces of Historic Glass, a small Bag of Rusted Metal Pieces, six Square Nails, two Brick Fragments, five Pottery Pieces, two Porcelain Pieces, several Cut Cow Bones, small Bag of Leather Pieces, Rope Fragment, several Cut Pine Pieces, a Bag of Charred Wood Pieces, a small Bag of Several Types of Cultivated Seeds, small Bag of Coal, Clump of Cotton, and several Cloth Fragments. Includes - small Bag of Bottle Glass, a few pieces of Historic Glass, two old Metal Cans, a small Bag of Rusted Metal Pieces, six Square Nails, various Pieces of Metal Hardware, three Brick Fragments, three Concrete Piece, five Pottery Pieces, two Porcelain Pieces, several Cut Cow Bones, several Cut Pine Pieces, a Bag of Charred Wood Pieces, a small Bag of Several Types of Cultivated Seeds, small Bag of Coal, several Cloth Fragments, and some miscellaneous Manufactured Item Fragments. These items from each of the basic categories have been pulled together to allow teachers to set up their own small sandbox dig. Included are a few broken artifacts (both lithic and faunal), debitage of all kinds, and many ecofacts. Choose between a prehistoric or an historic emphasis for this collection. These collections include a curriculum packet. These items are useful for the teachers setting up their own small sandbox dig. This collection is specifically for four students. Contains - Four Trowels, Four Broom and Dustpan Sets, One Set of Brushes, Four Measuring Tapes, One Line Level, One Set of Line, Twelve Specimen Bags, Four Dig Forms, One Quadrant Grid, One Sand Basin, and One Curriculum Packet. All you need to add is sand and items from the above collections. See Below to buy individual accessory items. These items are useful for teachers setting up their own small sandbox dig. Order individual items here or an accessory set for four people above. These items are useful for the teachers setting up their own garbologydig. All you'll need to add is the garbage. Contains - Three Large Plastic Garbage Bags, Box of Plastic Gloves, Plastic Ground Cover, Specimen Bags, Twenty Dig Forms, and a Curriculum Packet. These cards illustrate the difference in appearance of various items due to preservation issues. For instance, the Faunal Comparison Card gives examples of fresh, burnt, and old weathered bone and the Botanical Comparison Card shows fresh, old dried, and burnt examples of wood, seeds, and fibers. A simple sand art exercise used to demonstrate the Law of Superposition. Twelve Student Set. Contains - twelve Funnels, twelve Test Tubes, twelve Corks, several Bottles of Colored Sand and a Curriculum Packet. A simple exercise used to demonstrate the principle of Seriation for Relative Dating. Twelve Student Set. Contains - twelve sets of six Tiles, Worksheets and a Curriculum Packet. A basic handbook for 4th graders which covers the principles of archaeology, suggests various simple exercises, and includes tests for use in the classroom. The Plastic Meter Square is great for random surface collection as well as ecological recording. Comes dissassembled for ease of transport in a fabric carrying bag.